When you see severe delays on the boards, most commuters don't think about what is going on behind the scenes. I recently spent a Friday morning in the control room at Victoria Tube station. When I was there it didn't take long before the Victoria Line went down due to a fire alert - sparking major disruption. It was just after 08:00 BST - the height of London's rush hour. As crowds begin to build on the platforms, staff had to initiate crowd control and emergency measures - known as a congestion control and emergency plan (CCEP). It is like a massive game of Tetris, where the people in the crowd are the pieces. To the uninitiated, like myself, it is a panic-inducing sight with monitors showing hundreds of people crammed on the platforms. 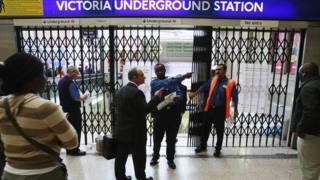 The outside gates to Victoria Tube station are shut to hold back the crowds from the busy train station. Then the ticket gates on the concourse are also shut. But as this is happening, some of the staff get abuse from commuters and the British Transport Police end up being called. "If in doubt keep them out," a staff member explains. The priority is to keep commuters safe. Victoria Tube station has recently undergone a huge refurbishment to create more space within the station. Another thing staff will try to keep crowds down, is to re-route commuters to new tunnels. This requires a longer walk but it means the crowds can be kept moving. By 09:30 BST the crowds have vanished - until next time. After the rush hour, the controller bought doughnuts for the whole team. A sense of gratitude to the staff for coping with a hectic, yet not unusual, rush hour. So, the next time you're being held at a gate, think about those workers inside the station and why they're doing it. It is because they are thinking about the many and not the few.